1. Hey draftniks. In the tradition of Philly fans booing the choice of Donovan McNabb because they wanted Ricky Williams, was their ever a guy your team drafted, that you hated, but turned out really well. 2. Which pick sent their franchise back the most: JaMarcus Russell, Cade McNown, Ryan Leaf or Akili Smith. 3. Best name in this year's draft? Pat Angerer? Scott Sicko? Maurkice Pouncey? One that I missed? 4. Who's the offensive Rookie of the year next year? The defensive rookie of the year? 5. 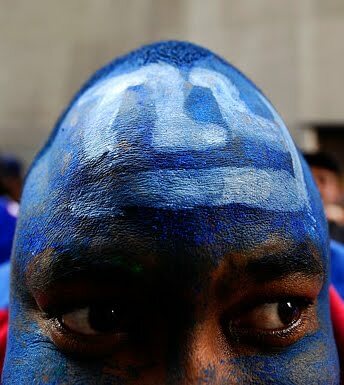 If your head was shaped like this guys, would you paint it blue and go to the draft? 1.Tiki Barber - he was coming off a knee injury the year before, and I thought he was too small. I thought they could get a David Meggett type player later in the draft. My bad. 2. Akili Smith - the Bungles stunk until they were able to get Palmer 4 years later. 3. I like Zane Beadles. Throw a middle name in there and you've got a serial killer. 5. I would try to be an extra in True Blood or some other vampire show. 1. I've been thinking about this, and not really. I am always overly optimistic. 5. No, but then the only way I would go to the draft is if they held it in my back yard.